If you have a decent bow and you are putting the bow away in your regular bass case cover pocket (without a hard case) you've probably have had to deal with more than your fair share of issues regarding the hair of the bow. 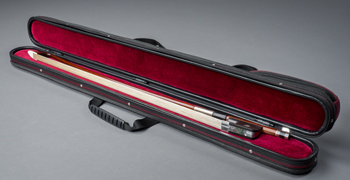 A good bow case not only protects your expensive bow from breaking, it keeps the hair from getting contaminated or ruined by having that hair getting hot and bunched together with the sticky rosin. All it takes is one sunny afternoon to get the hair and rosin 'gooped' up so that you end up needing a re-hair. It's not worth prematurely ruining the hair, so get a good case. We currently sell two brands of bow cases: the black Cordura covered hard Bobelock case and our new, String Emporium® S.E. brand case that is exclusively to our company. All photos on this page are clickable for larger image. 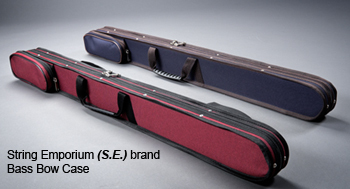 Our newest bass bow cases that we now offer were specially made for us by a top violin case manufacturer in China. These have a different look in that while the Bobelock cases only come in black, these we had made in dark green, brown, ruby red, navy blue as well as the traditional black, all with brown colored trim. These too we had the covering 'bolted' on so that it won't peel or fall apart. Additionally, the biggest attribute with these bow cases is that we also specially ordered the YKK brand zippers to be sewn into these cases! We did this because we just couldn't stand the cheaper Chinese made zippers. They broke quickly and were cheap. The American made YKK zippers last the longest for sure and it is really the only way to go for us. There is no substitutes for these. These zippers are expensive and that's why no one else uses them. As is our tradition here at S.E., we only sell the best quality accessories. We too could buy the cheap bow cases that we see on the internet for $50, but when the case falls apart and our customer has to go out and buy another bow case, then no one really wins there. These cases are well built and made to last for years of heavy usage. We have both French or German models. They also come with nicely proportioned rosin/pencil pockets (also using the YKK!) Be sure to click on the photos of these new cases here as with the large image pop-ups, you can see a lot of the nicer details and quality construction. 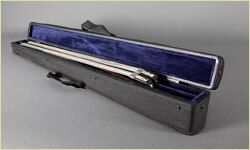 These are cheaply priced, but not 'cheap' quality bow cases. $58.00 for either French or German model and offered in Red with black trim, Black with brown trim, Dark Green with brown and Navy Blue with brown trim. All of these bow cases come with nice shoulder straps. We only sell what we, as professional bass players here like to use! The Bobelock is made using the old fashioned (more expensive) way of laminate boxing which is nicely covered in Cordura fabric. The fabric is bolted and glued onto the case. The interiors are plush lined and most importantly, fitted for whichever model bow you use (French or German). Once the bow is placed in the case, it stays put no matter which direction the case is placed or falls. Both the German and the French model cases have a nice rosin/pencil pocket on top. Steve (the owner of S.E.) has personally used his Bobelock case for more than 10 years of heavy use, so they hold nicely. The Bobelock is still the best hard bow case in the business. It's not the cheapest, but over the years of usage you will enjoy and rely on it to protect your nice bow. These come in single and double bow cases. While it comes with a shoulder strap, the rosin pocket is big and long enough to fit a pencil and some of the smaller rosin canisters (like Nymans or Kolsteins).